Last week, we celebrated American Independence Day, which is better known in America as Fourth of July. 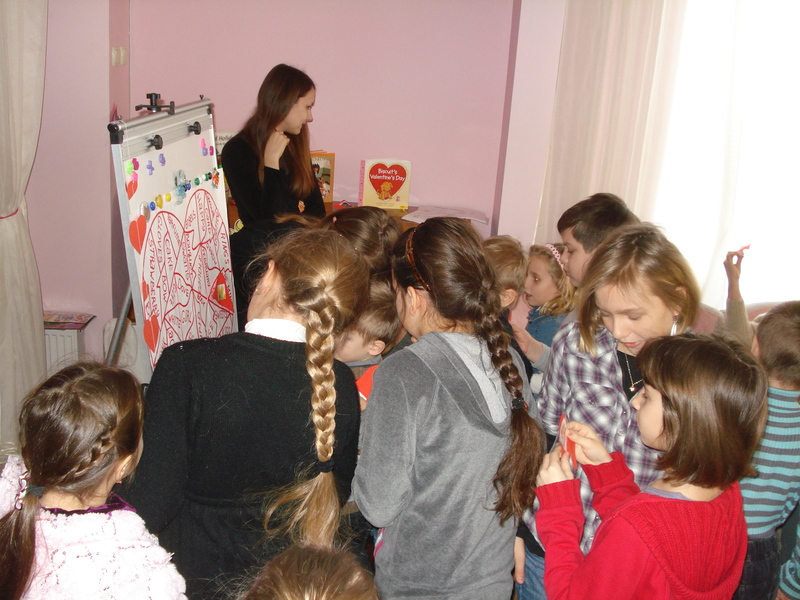 We had a nice group of children ages 5-15 who joined us to learn about this holiday in America. We had two American guests, Darell Francis and Steve McCafferty. They are also Peace Corps Volounteers. 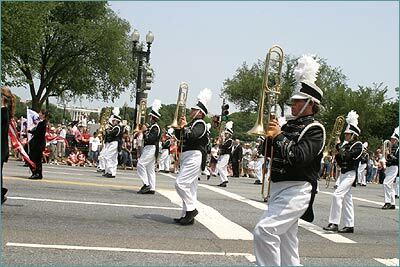 We talked about the parades, public speeches, picnics, and fireworks that are always part of our Fourth of July holiday. It is a day when we remember the difficult struggle for Independence and express our gratitude for the leaders of our country who fought the Revolutionary War to become free of England. July 4, 2012 is the 236th birthday of the United States. We played games and made a wonderful poster with Uncle Sam on the poster. Uncle Sam is not a real person, but he is a symbol of our Independence. He is dressed in red, white, and blue which are the colors of the American flag. Many people in the United States dress in red, white, and blue on Fourth of July. We also talked about food that we would eat in America at the picnics and parties that are a big part of our celebration. Hot dogs, hamburgs, corn on the cob, and watermelon will always be part of any American Fourth of July. On Coney Island, in New York City, the 94th annual Nathan’s Hot Dog eating contest took place on Fourth of July. We watched the YouTube video of this contest, which is very funny. The male winner ate 64 hot dogs (and buns) in 10 minutes and the female winner ate 45! It is said that this contest was started by a group of immigrants to America who wanted to show that they were true Americans because they could eat the American hot dog! 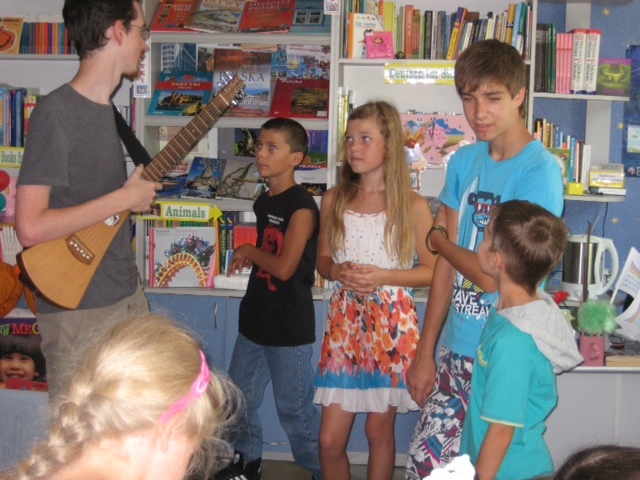 The best part of our celebration was Darrell playing his guitar and letting the children take a turn as well. Darrell sang American favorites such as “Dead Skunk in the Middle of the Road” and also sang a Russian song that he has learned. Everyone sang along with Darrell and had a good time. 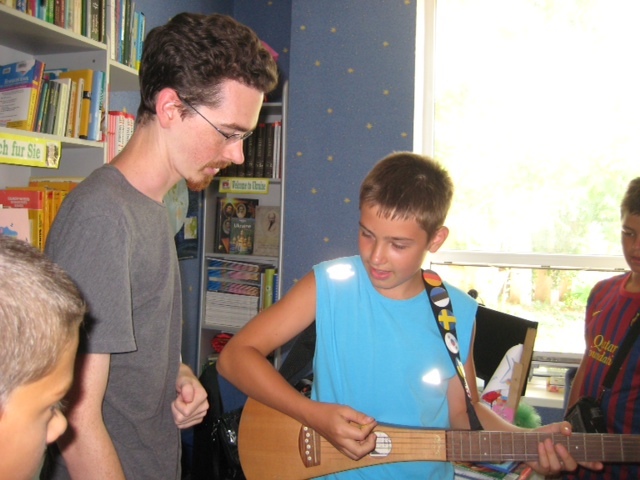 We will invite our guests to come back for another celebration and will make sure that Darrell brings his guitar. 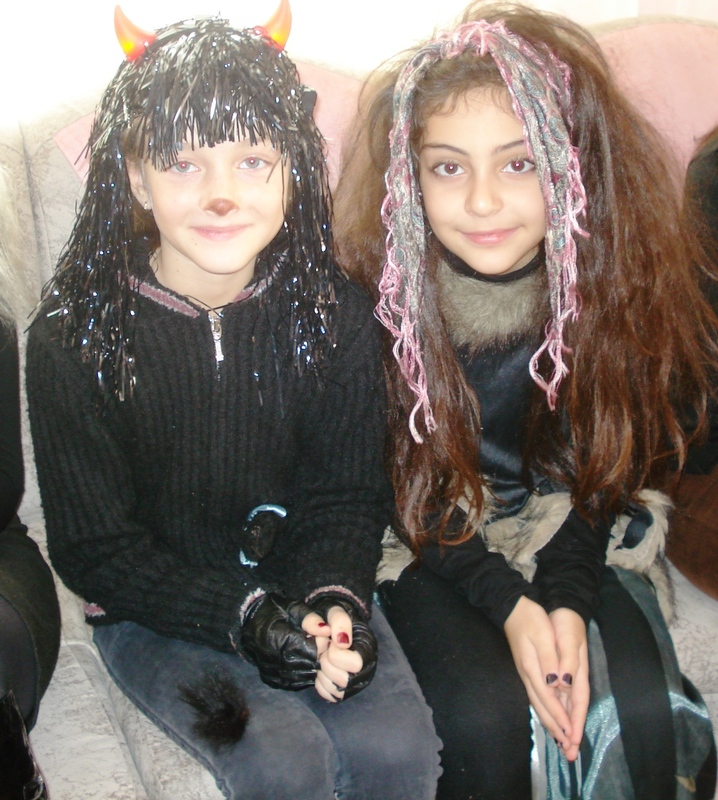 Two black cats - Anya and Deborah! 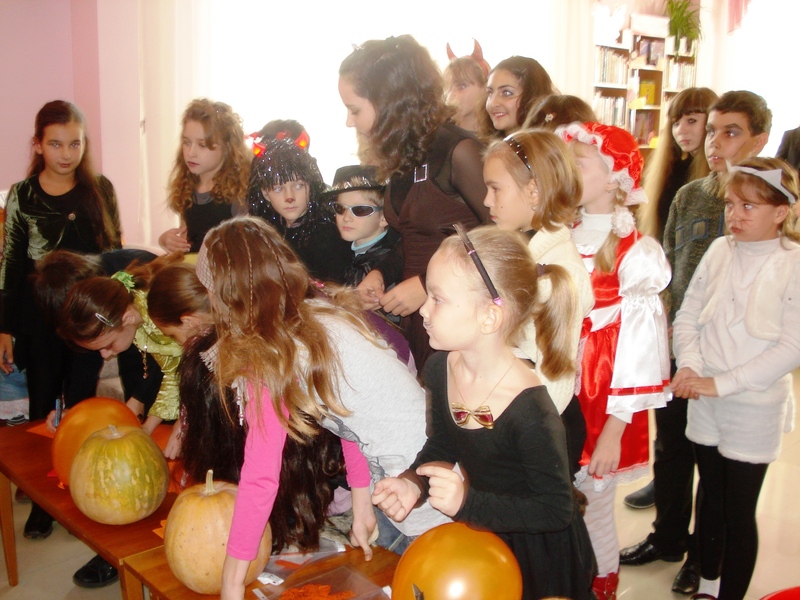 What a wonderful time we had at the Kherson Oblast Children’s Library Halloween Party! 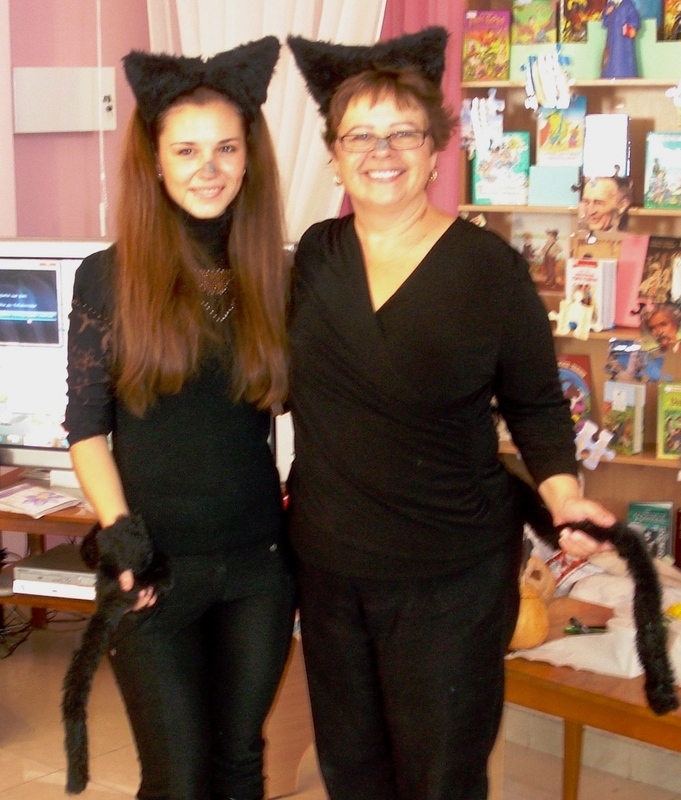 We had more than 50 people attend our Halloween Party, which was led by 2 very friendly black cats – Anya and me, Deborah. 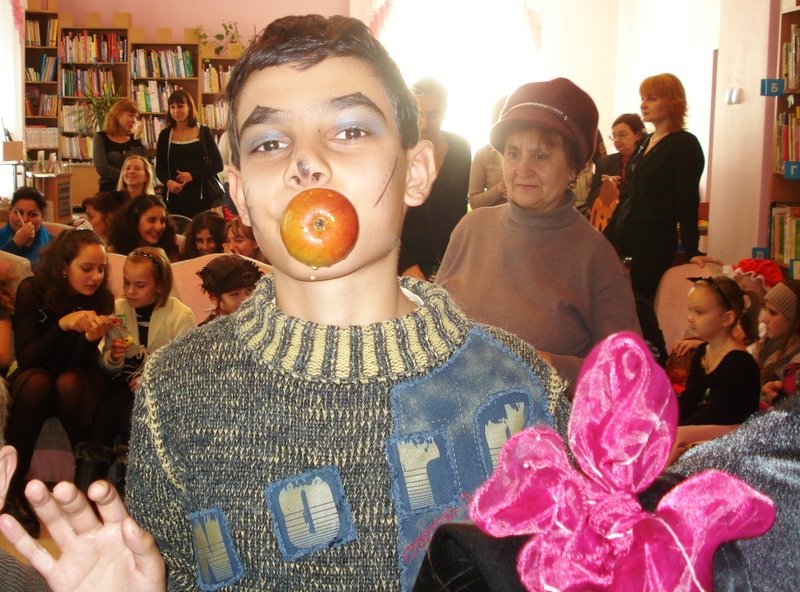 Take a look at the pictures below…they tell you the story of our Halloween fun! 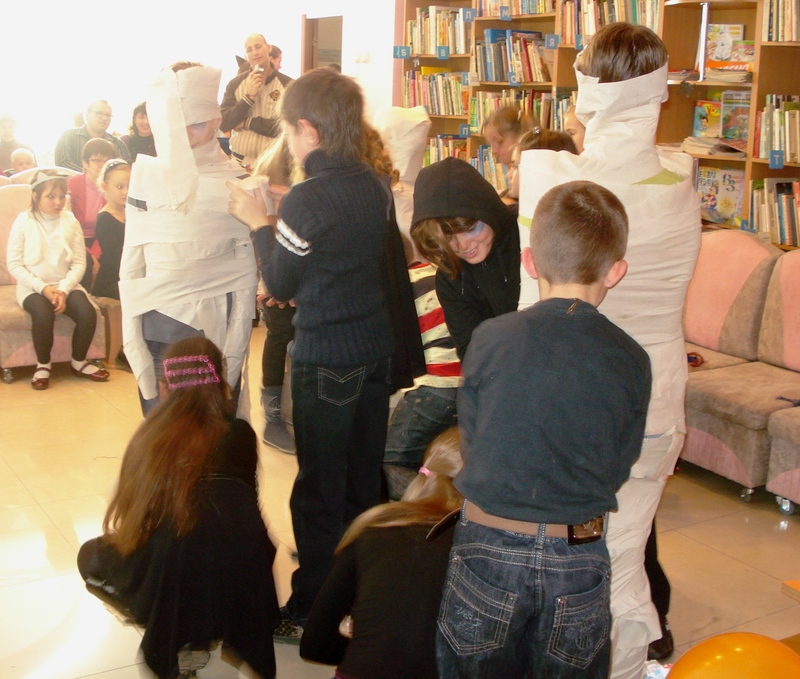 We had a “best costume” contest and played games like making a mummy out of toilet paper. Above are the winners of our “Make the Best Mummy” contest. 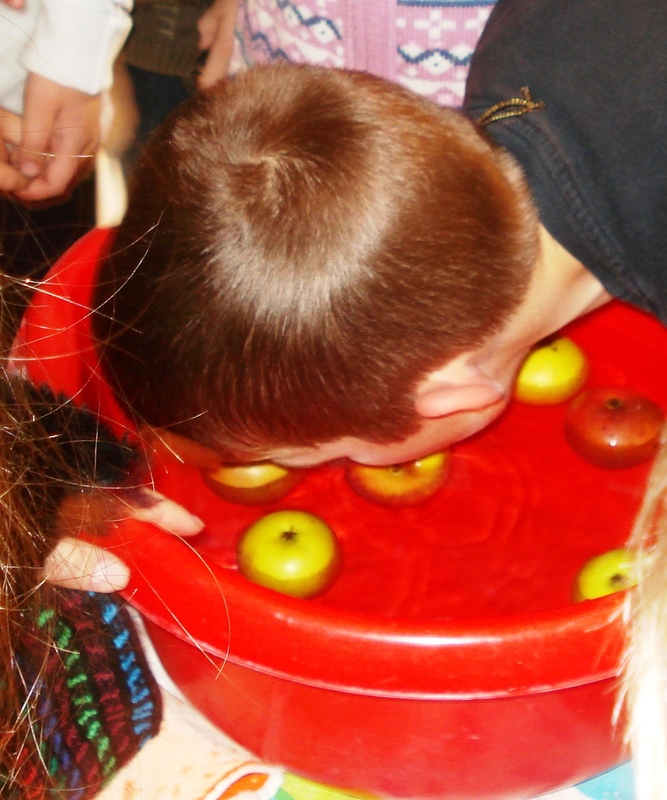 We “bobbed for apples” and almost everyone got an apple and got a little wet. 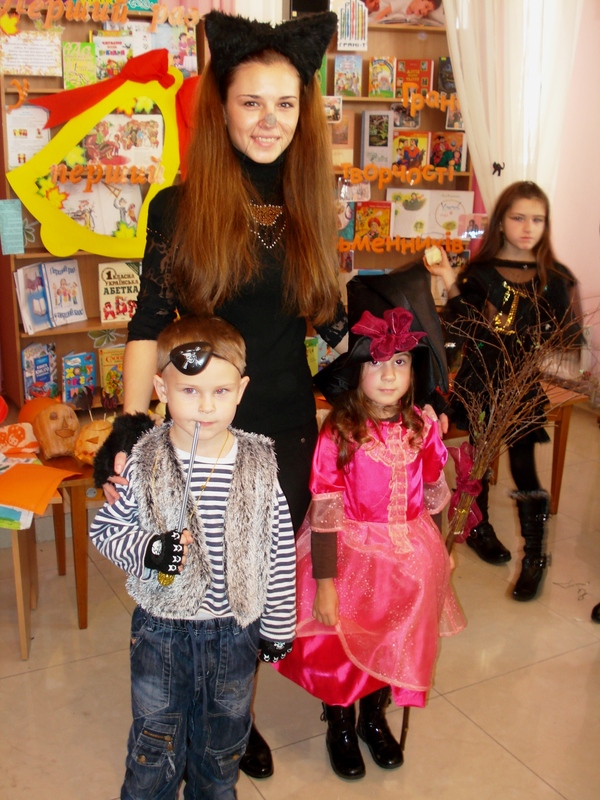 Our Halloween Party guests came in wonderful costumes! 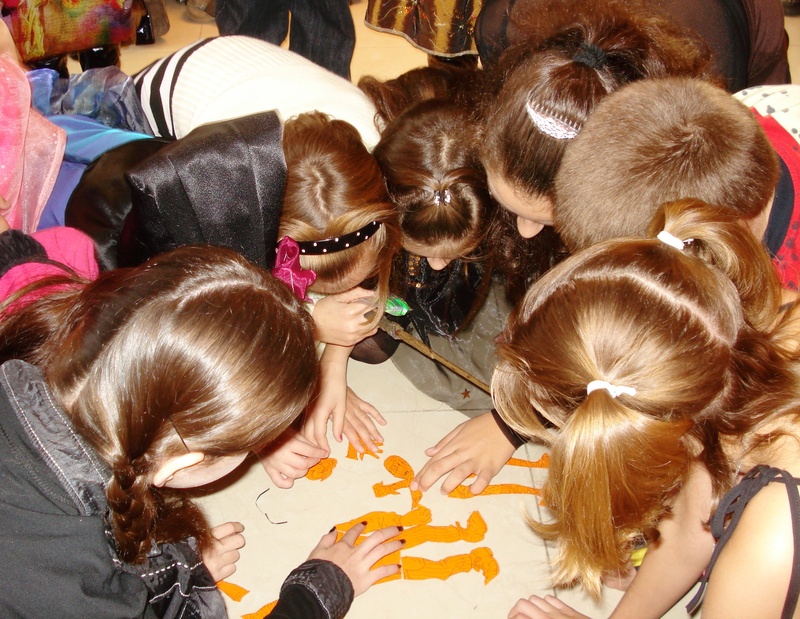 Our games included monster and skeleton puzzles, making new words from the letters in Jack O Lantern and guessing how much candy was in the candy jars. 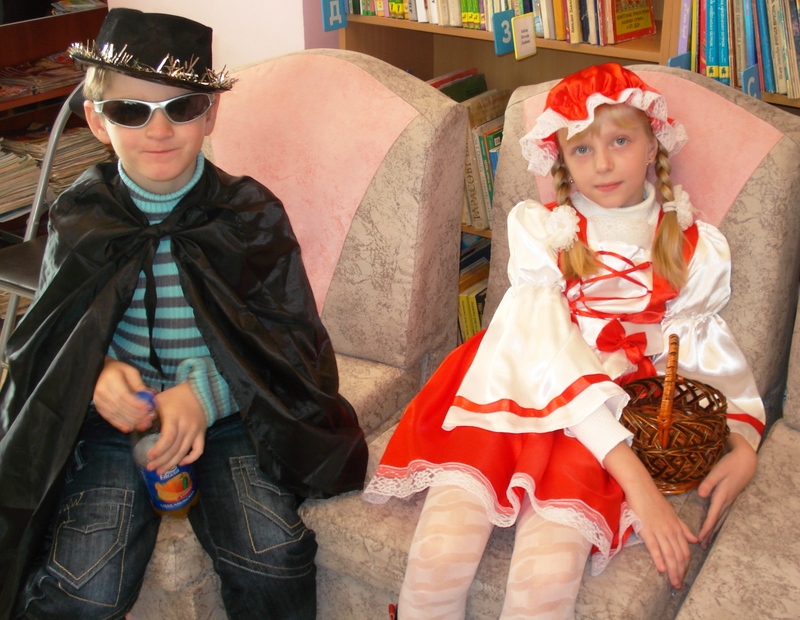 And after we were finished our party, we went “Trick or Treating” in every department of the Library….yum yum….lots of candy! The 4th of July is a very big holiday in America. It is Independence Day, the day America adopted the Declaration of Independence. This is the day we celebrate our freedom, our democracy and our love for our country. The story of America’s independence started many years ago with the American Revolutionary War. This is the war that the Amrican colonies fought against Great Britian. On July 2, 1776, America’s Congress voted to be formally separated from Great Britian. It was a committe of five congressmen, led by Benjamine Franklin, that created the Declaration of Independence included. The Committee also inclued Thomas Jefferson, John Adams, Robert R. Livingston and Roger Sherman. The 4th of July is a National Holiday. Most people do not have to work and most businesses are closed. Americans celebrate the day with parades, picnics, family gatherings, festivals and fireworks. Some of the traditional food eaten at the many picnics include hamburgers, hotdogs, potato salad, fruit salad, corn on the cob, apple pie, ice cream, macaroni salad and baked beans. The hamburgers and hot dogs are cooked on a grill just like Ukrainians use to cook Bar B Q (shashleek). 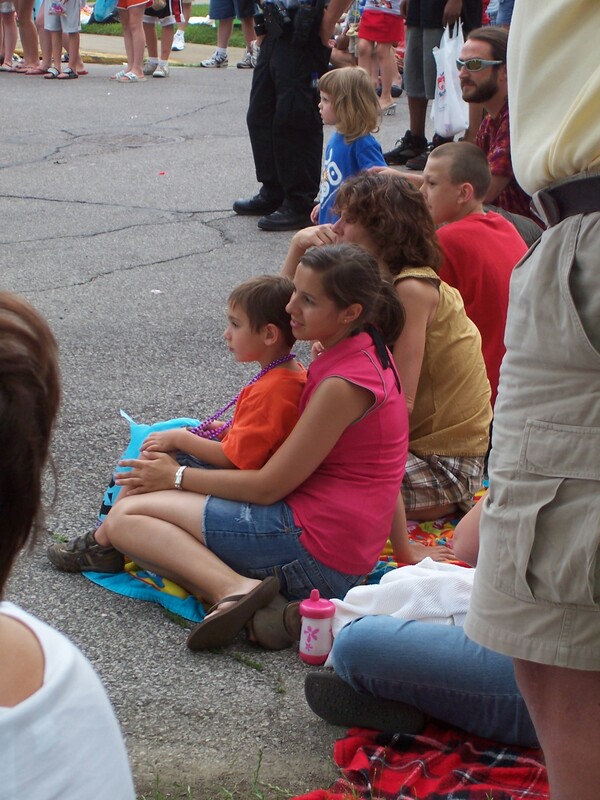 Below are some pictures from parades and picnics with my family in America. Everyone loves the 4th of July Parade in Fairport Harbor. This is a photo of my daughter Darcie watching the Parade. 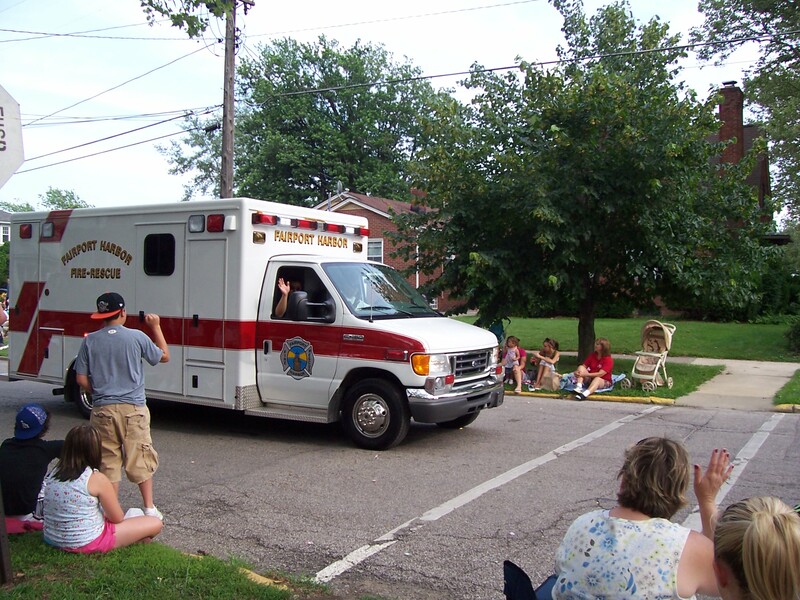 The Parade always includes firetrucks and emergency squads (ambulances) from the local Fire Departments. Easter is almost here. It is a special religious day for each of us.We have many traditions in our religions. In America, there is a tradition about Easter also. It is a special day for the Easter Bunny comes to visit! 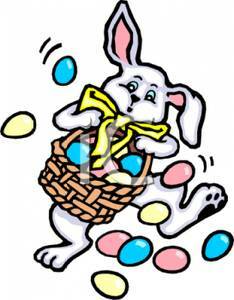 The day before Easter, the Easter Bunny fills baskets with candies and colorful eggs and leaves them for children while they sleep. 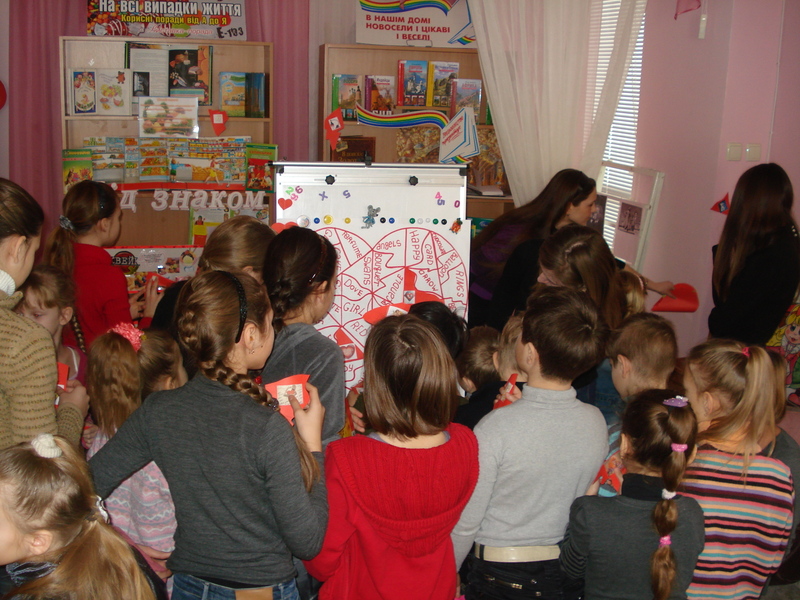 When the children wake up, they search around their home to find their baskets filled with their special treats. Where did this strange tradition of the Easter Bunny come from? Well, long ago, before people were Christians, a festival was held for the Goddess Eastre in the Spring. 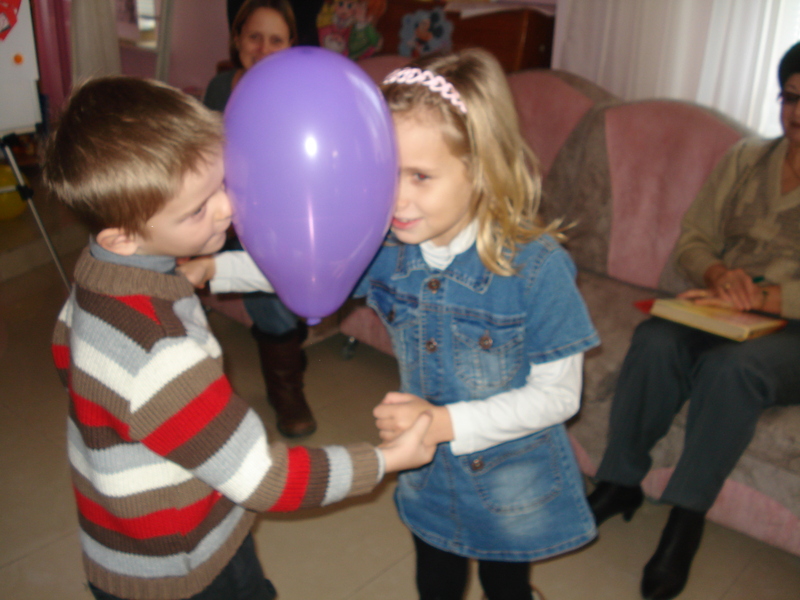 There is a story about the Goddess Eastre that says she wanted to entertain the children of the world. So one day she turned her pet bird into a bunny and had is lay colorful eggs which she gave to the children. See how it all makes sense? Will you be looking for the Easter Bunny? I hope everyone’s holiday was as fun and happy as mine. I went to America for the holidays and spent Christmas and New Year’s with my family. 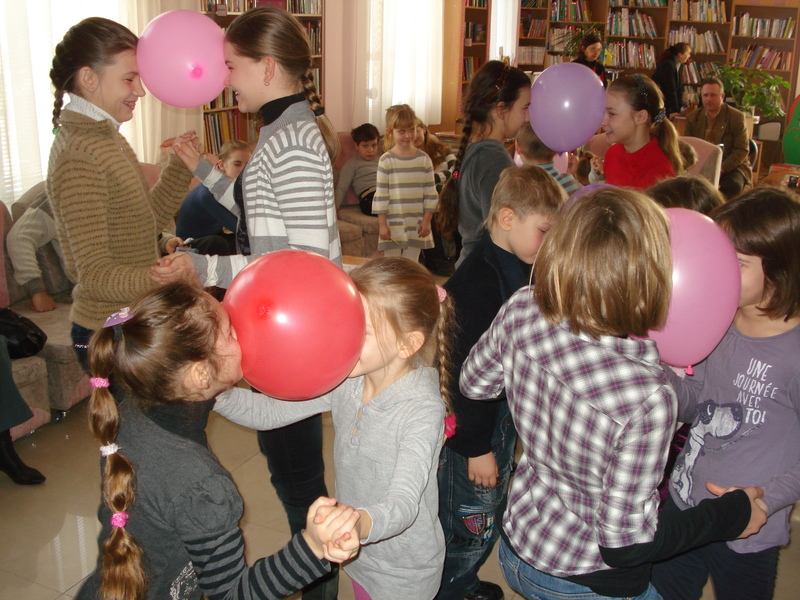 There are a few differences between the holidays in Ukraine and in the United States. 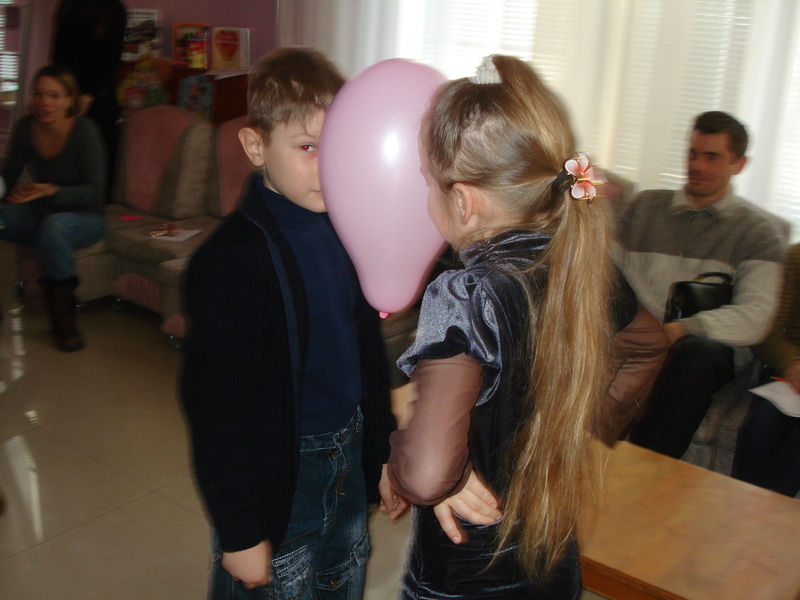 One of them is the date. In America, we celebrate Christmas on December 25th. Every family may have their own traditions on how they celebrate, but Americans observe this day as the birth of Christ and when Santa Claus comes with presents. Most of the businesses close for Christmas including grocery stores, restaurants, pharmacies and offices. Gas stations are open and of course, the police officers and firemen have to work because there might be an emergency or fire. In my family, we celebrate both Christmas Eve and Christmas Day. On Christmas Eve, all of my husband’s family gather together for the traditional Italian dinner of 7 different fish. This tradition is very old, and we believe eating 7 different types of fish will bring you good luck all 7 days of the week. The number 7 symbolizes the 7 Sacraments in the Catholic Church, the 7 continents in the world and the 7 Great Wonders of the World. This year, we ate cod-fish, shrimp, lobster, sardines, crab, squid and smelts. After dinner, we opened presents t out by the head of the family – my father-in-law. Then we ate pastry that is also traditional – belish (small fruit filled cookies), nutroll, biscotti (Italian cookies) and buckeyes. If you don’t know what buckeyes are, read my Blog, “What is Falling from Above.” The recipe for buckeyes is there. After a fun evening of food and presents, we went to midnight mass at St. Cyprian’s Church in my hometown of Perry. There was a lot of singing at mass and we enjoyed hearing and singing the Christmas Carols. Then it was off to bed! On Christmas morning, my daughters and I got up and discovered that Santa Claus had been to our house. We must have been good girls! We had many presents under the tree and gifts of candy in our stockings, which were hung above the fireplace. 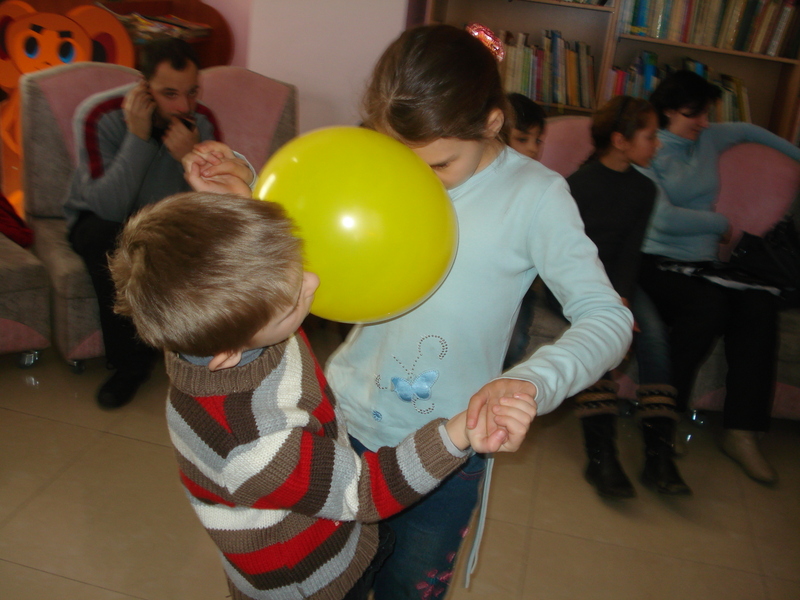 After we opened our presents, we went to the kitchen to begin preparing another traditional meal – turkey. My daughters did the cooking and I watched. They let me rest because every year I prepare the meal, and it was a wonderful gift to me to have them do the cooking this year. One my sisters and her family came to my house to have Christmas dinner with us. Our traditional meal included a turkey and stuffing, ham, sweet potatoes, zucchini, green beans, mashed potatoes and turkey gravy. We said a prayer before eating to thank God for the food and that we can once again be together. For dessert, we had apple pie, chocolate cream pie and pumpkin pie with whipped cream on top. After cleaning up the kitchen and washing the dishes, we went into the living room to rest…we ate too much just like most people do at a special feast and we were tired! Later, so many more family members came over that we had nowhere to sit. It was a wonderful day full of good food, much talk and happy voices sharing memories of Christmases past. 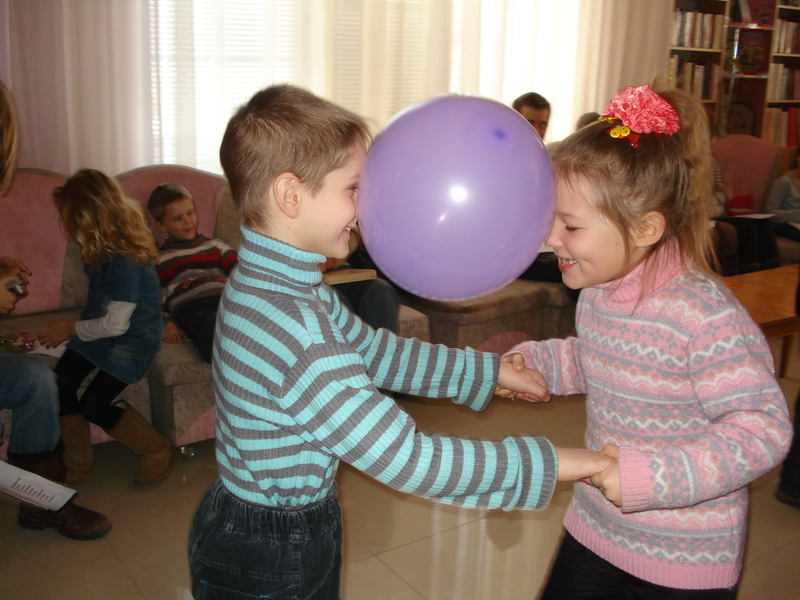 During the holidays, we like to talk about when we were young children and how it was different or similar to today. We also talk about the family members who are no longer with us, and how much we miss them. We keep our loved ones alive through our stories and happy memories. In America, the New Year is celebrated on New Year’s Eve, December 31st. and on into the early morning hours of January 1st. 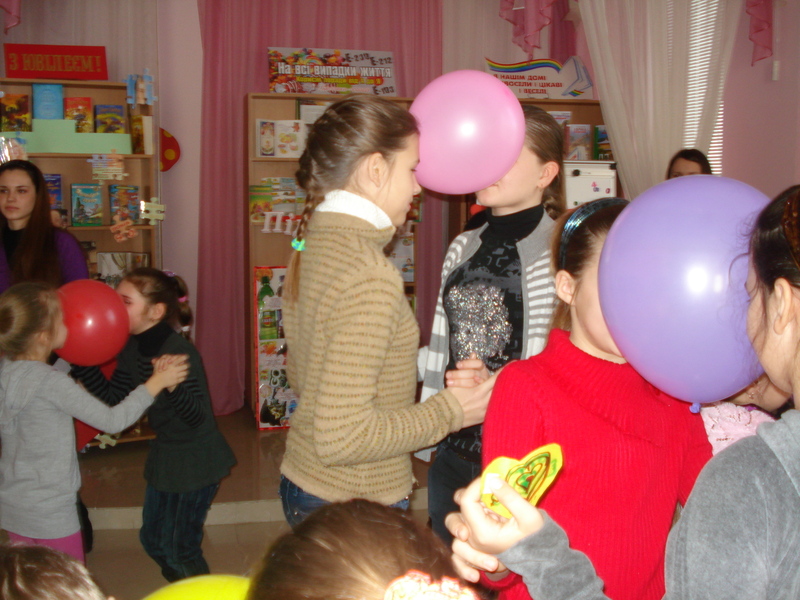 There are many parties at peoples’ homes and in cafes and restaurants. My family likes to stay home and play games such as Uno and Scrabble and toast the New Year at midnight with Champagne. This year, it was my daughters, Hallie and Darcie, Darcie’s boyfriend Mark and me. We had so much fun playing different games that we almost missed midnight and our Champagne toast. To me, New Year’s means a new beginning…starting over with a fresh new year and a fresh new opportunity to do all the things that are important. 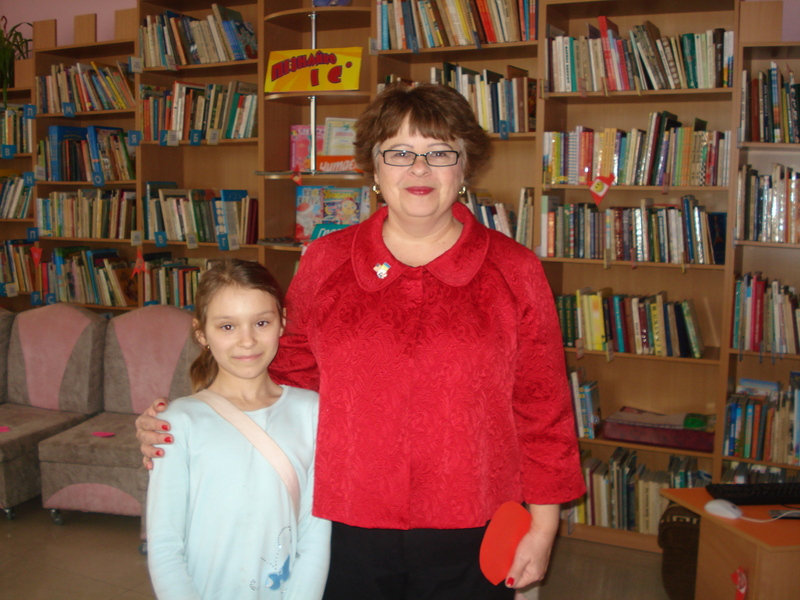 Being with my daughters, sisters and all my family meant a great deal to me, but I did miss all my friends in Kherson and those in other cities in Ukraine. 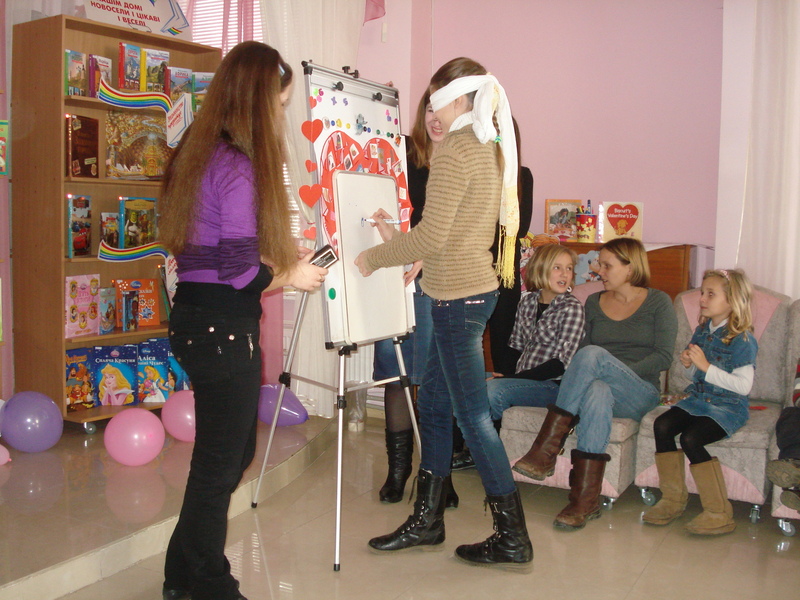 I thought about all the people from my English Clubs and hoped that everyone was enjoying their holidays also. 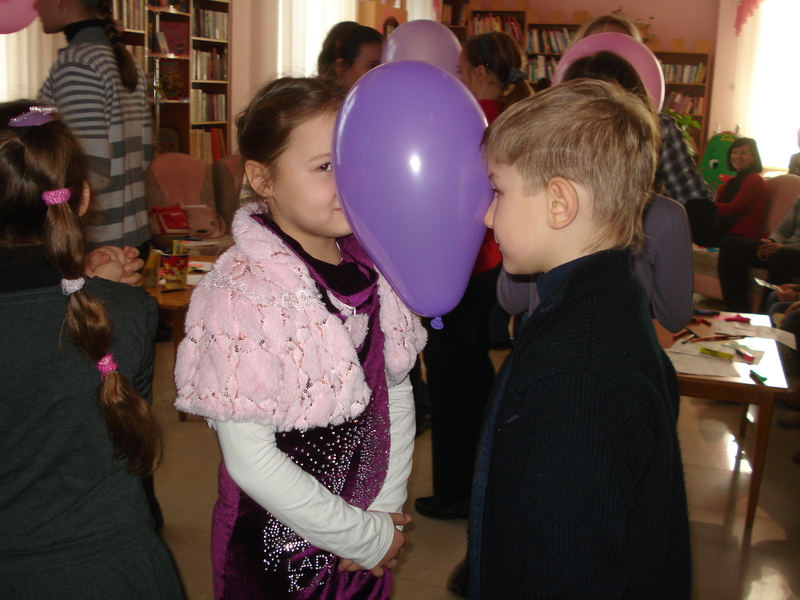 Happy New Year to you and I hope to see you in the Kherson Oblast Children’s Library very soon.